Are Amish “born again”? Are cars immoral? When describing church, why do Amish use the term “Gmay” instead of “Kirche”? And who actually decides the rules that guide Amish life? 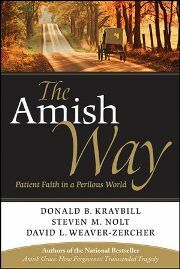 The Amish Way: Patient Faith in a Perilous World is the first book to explore Amish spirituality and religious practices in-depth, addressing these and many other questions along the way. Authors Donald Kraybill, Steven Nolt, and David Weaver-Zercher (who previously collaborated on Amish Grace) dissect the many ways religious beliefs shape daily lives of the Amish. I had a chance to read an advance copy this summer, and thoroughly enjoyed it. It’s the kind of book that is easy to pick up and digest, with many vignettes and contributions from Amish themselves making it a very engaging and lively read. The authors do a great job of fleshing out the tenets of Amish Christianity, and the many Amish voices give it a high degree of credibility and realism. You come away with a deeper understanding of why Amish live the way they do, a clearer conception of what they believe and what holds Amish communities together. Coinciding with the release of the book this week, the authors have kindly answered some interview questions for the blog today. We are also giving away 10 copies of The Amish Way in this month’s book giveaway contest. …for a possible total of 8 9 entries (whoops, 1+3+5 actually equals 9 😉 and I may need to sign up for remedial math!). This time around, you’ll see sharing on your blog and/or Facebook packs more of a punch, but even a quick comment on this post gets you a chance to win. And by doing all 3 of these, that’s not a bad chance to win one of the 10 books! The 10 winners will be drawn and announced Wednesday, October 12. Amish America: Generally speaking, in what ways does Amish spirituality differ from that of mainstream Christians? Donald Kraybill, Steven Nolt, David Weaver-Zercher: Like other forms of Christian spirituality, Amish spirituality aims to help people align their wills with God’s will. What makes the Amish way distinctive is that in the Amish case, God’s will is discerned through the local Amish church community. In other words, their spirituality is community-oriented, not self-oriented. This communal orientation is striking and shows up at many turns. One example would be in the skepticism Amish people show toward people who say that God spoke to them individually. For the Amish, God speaks through the community, and individuals are best guided by submitting themselves to the wisdom of the Amish community, past and present. 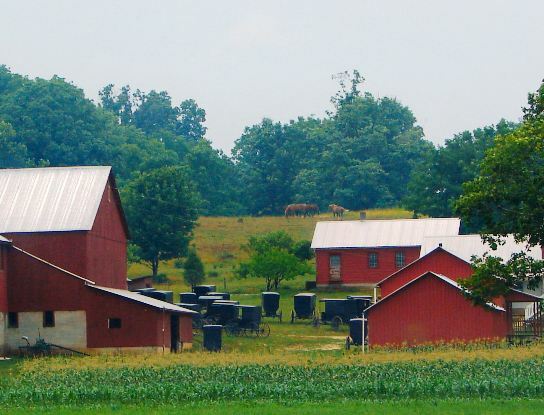 Another distinctive aspect is how Amish spirituality directly touches a broad range of issues from dressing to occupations, from technology to household furnishings. 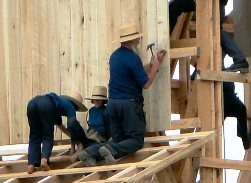 AA: Barn-raisings are well-known examples of the mutual aid Amish practice, though they occur relatively rarely. Can you share other examples of ways tenets of Amish spirituality are manifested in daily living? Kraybill, Nolt, Weaver-Zercher: Family prayer times—before and after each meal, and often before going to bed—are perhaps the most obvious example. But Amish people demonstrate their spiritual orientation in numerous less obvious ways—sometimes in ways that outsiders wouldn’t characterize as spiritual. For instance, the Amish commitment to plain, uniform dress is rooted in their view that God wants people to demonstrate modesty, humility, and submission to the church. Their reticence to adopt new technologies demonstrates their commitment to communal tradition and also a commitment to rhythms of time that refuse to conform to the world. They realize that many new technologies—cars that take people far and wide, and video technologies that link people to the larger world—can undermine one’s commitment to the local, Christian community. AA: In The Amish Way, you describe the Amish as a “community of accountability”. Shunning, you point out, is often negatively perceived by the public, but that “holding members accountable is the flip side of the community barn raising that outsiders celebrate.” Can you explain this relationship between mutual aid and church discipline? Kraybill, Nolt, Weaver-Zercher: One way to put it is this: the Amish believe that one reason the church exists is to help individual church members when they are in trouble. Troubles take many forms, of course. For instance, if a family member is ill or incapacitated, the Amish believe that the church exists to assist the affected family financially or in other ways; they believe that the church is shirking its duty if it doesn’t help that family. In the same way, the Amish believe the church is shirking its duty if it doesn’t help a wayward person return to the church’s ways. This happens through church discipline, when church leaders talk to, plead with, and sometimes punish a person who has chosen to forsake the ways of the church. AA: There exists a negative stereotype of the heavy-handed Amish bishop. How does ministerial authority function? To what degree do bishops actually set the course for a congregation? Kraybill, Nolt, Weaver-Zercher: The bishop in a local congregation is the team leader among the ordained men (typically a deacon and two ministers). The bishop does not have complete independent authority to make decisions. When the rules and regulations are reviewed twice a year, members of the congregation must agree/approve them in a formal vote. Likewise if a bishop proposes to excommunicate someone, that decision is also ratified by the congregation. Furthermore, a bishop may consult or at least take into account the views of nearby bishops as well. All of these factors provide a check on his power. If an issue is brewing in the congregation, before a bishop will propose an action to the membership, he will want to have the support of the other ministers and also expect that the congregation will endorse the proposal. The bishop does have considerable authority (as a gatekeeper of sorts) in that he can determine which proposals he will bring to a members meeting and which ones he will table. The bishop is also the key interpreter of the mean and practical implications of the rules and discipline ratified by the congregation. Nevertheless, the personality and leadership style of bishops vary greatly and determine the extent to which he is viewed as a heavy- or light-handed servant of the congregation. AA: In The Amish Way, one of your informants, Bishop Eli, expresses his disapproval of a “two-track system of salvation”. What is meant by the idea of a two track system? How do Amish view salvation? Kraybill, Nolt, Weaver-Zercher: Bishop Eli’s complaint was focused on Christians who separate theological belief from obedience to a certain lifestyle, that is, Christians who say that a “personal faith” can exist separate from practical matters of daily living. For the Amish, reducing the Christian faith to a “personal relationship with Jesus Christ” is inadequate in two ways: it shortchanges God’s demand for holy living, and it discounts the importance of a Christian community to help individuals understand and meet that demand. Part 2 of the interview with the authors of The Amish Way. About the Authors Donald B. Kraybill, Ph.D., is senior fellow at the Young Center of Elizabethtown College in Elizabethtown, Pennsylvania. Steven M. Nolt, Ph.D., is professor of history at Goshen College in Goshen, Indiana. David L. Weaver-Zercher, Ph.D., is professor of American religious history at Messiah College in Grantham, Pennsylvania. I WOULD LIKE TO RECEIVE THIS OFFER. I LIKE TO READ ANY BOOKS ABOUT THE AMISH WAY OF LIFE. I RESPECT THEM AND AM ALWAYS HAPPY TO LEARN MORE. GOD LOVE YOU AND PROTECT YOU AND YOURS. I am too late for this giveaway. I would love to get a copy of your book. Anyway I will link you on my blog and Face book. I love reading anything Amish. Would love to read this as well. Thanks for giving away this copy. How interesting. I live in northeastern Ohio and there a a lot of Amish living here. I would love to learn more about their beliefs and customs. Count me in for the giveaway! I would like very much to read all of the books they are so good and you learn a lot from reading about the Amish.They are interesting to learn about. I go once a year to visit in PA. I enjoy all the authors, there are so many. It would be very nice to win. Hello, I would love to win this contest!!! I enjoy readindg and learning new and interesting things about the Amish. Happy to have foundthis website.Have always been interested i Amish life,ways,and beliefs.My favorite reading material are Amish books.My great-grandparents came here from the Netherlands and Germany,but do not know if they were Amish or not.Would love to be able to find out.They settled first in Pennsylvania,and later moved to Missouri. Judy we’re glad you found it too. Sounds like you have a rich background to explore. Appreciate you sharing! I love visiting the Amish in Berlin Ohio !!!!! They are amazing people,so peaceful. It’s like stepping back in time. I buy every Amish book I can get my hands on & this one sounds great!!!! I hope I win one ,but if not I’ll have to look for it !!!! I love reading Amish fiction novels….that’s all I read!!!! So many awesome Christian Amish writers!!!! Love them. Very happy to find this site! I live next to an Amish/Mennonite settlement in New York State and have enjoyed making friends with them. I have been a huge fan of Amish life and Amish Fiction. The Amish way of life is a lifestyle/way of living a Godly life. It is an ideal to live up to, for me. I enjoy reading the Amish fiction because there is no blasphemy, sexual content, sensationalism, and other ways of thinking that lead away from Christ. Thank you so much for writing about this faith. I would SO like to be included in contests to win books(hardback, Ebooks or Kindle). I have been interested in Amish life since I was a teenager, looking particularly at the simplicity of their lives. I crave simplicity in all aspects of my life and feel both irritated and aggravated with chaos and confusion. I was raised catholic and almost became a nun due to the simplicity and calm in most orders. Can’t wait to read is book, hopefully, in the not too distant future pay a visit to Amish country.